WASHINGTON – The United States and Russia are nearing a new nuclear arms pact to replace the Strategic Arms Reduction Treaty, set to expire Dec. 5. The Obama administration has said the talks are going well and that new limits on the nuclear arsenals of both countries should be announced soon. 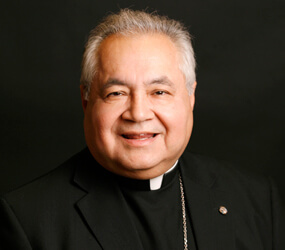 As the negotiations continue, Catholic News Service spoke with Auxiliary Bishop Gabino Zavala of Los Angeles, the bishop president of Pax Christi USA, the Catholic peace organization. He offered his views on the negotiations and the prospects of worldwide nuclear disarmament. Q: You’ve said in recent speeches that the world is at a new moment, where nuclear disarmament is a possibility. Explain what you mean. A: You have to look at what has been going on recently. Just a few months ago President (Barack) Obama spoke in Prague (Czech Republic) and committed the United States to nuclear abolition. There have been statements from former world leaders, such as Mikhail Gorbachev of Russia. Then in The Wall Street Journal, (former U.S. hawkish government officials) Sam Nunn, Henry Kissinger, William Perry and George Schultz supported nuclear abolition. With all of this going, there is new momentum for abolition. Also, just a few weeks ago the German government asked the United States to remove its tactical nuclear weapons. With all of that I feel that this is a moment of enormous promise. Q: The Strategic Arms Reduction Treaty expires Dec. 5, but reports indicate talks between the U.S. and Russia on a new pact are going well. What are your observations? A: I believe that we can achieve nuclear disarmament. I know that Dec. 5 is a big date. I hope the negotiations will bear fruit by early December. One of the things we also need to begin to do is to de-alert our tactical forces. We’re still on a hair-trigger type of alert, ever since the end of the Cold War. That has to end. Q: Because the U.S. and Russia possess 96 percent of the world’s nuclear weapons, what is the responsibility of the two countries to reduce their arsenals? A: They bear the greatest responsibility. Without the leaders of the United States and Russia really negotiating this, how can we expect that there’s going to be nuclear disarmament for the rest of the world? The crux is that it’s good for some and not for others. Even in the whole controversy about Iran having nuclear weapons, we don’t complain about other countries having them. I think there has to be an end for all nuclear weapons. Q: In 1983, when the bishops’ pastoral letter on nuclear weapons was adopted, the morality of such weapons was addressed. What does that document say to us today? A: I think the bishops in 1983 allowed for possessing nuclear weapons as a deterrent only for awhile. Their intention was that eventually there would be an end to nuclear weapons. That was stated not only in their pastoral, “The Challenge of Peace,” but also 10 years later in “The Harvest of Justice Is Sown in Peace.” The church was trying to promote a nuclear-free world. One of the things the church continues to look at is the whole question of morality. This summer we had Archbishop (Edwin F.) O’Brien (of Baltimore) addressing a military-sponsored nuclear deterrence symposium. He made a finer point of the vision of the church. He talked about how the task is not to make the world safer from the threat of nuclear weapons, but to make the world safer through mutual and verifiable nuclear disarmament. The church has been a leading voice. Beginning at the United Nations, the Holy See is hoping, just as chemical and biological weapons have been banned, that there would be a ban on nuclear weapons. Q: What other steps can the church take to share that moral voice? A: We have an important role to play in identifying and addressing the moral dimensions of policy. One of the things we see is that God’s people go hungry, go without health care or without access to clean water or education or without the basic necessities of life. The Vatican has been unequivocal in saying that the nuclear arms race kills the poor, stealing resources that should rightly go to lifting them from poverty. That’s one of the things we need to continue to speak on. Q: As negotiations continue, what can the bishops’ two documents on peace say to people in the pews? A: I think people have forgotten that we have come up with these documents. We need to be reminded of them. They continue to raise giant points about the evil of nuclear arms and point to what we as citizens of this country need to promote. We want a world that is a world of peace. That’s what we need to promote. Q: There will be people in the church who will disagree with your view. A: There are some who feel I’m not being patriotic because I’m talking about these things. We live in a time when people’s fear and anxiety are raised. But you can go back to a statement that Pope John Paul II made: When we are a people at war it is a defeat for all of us; if we are a people of life, we need to live that as well.